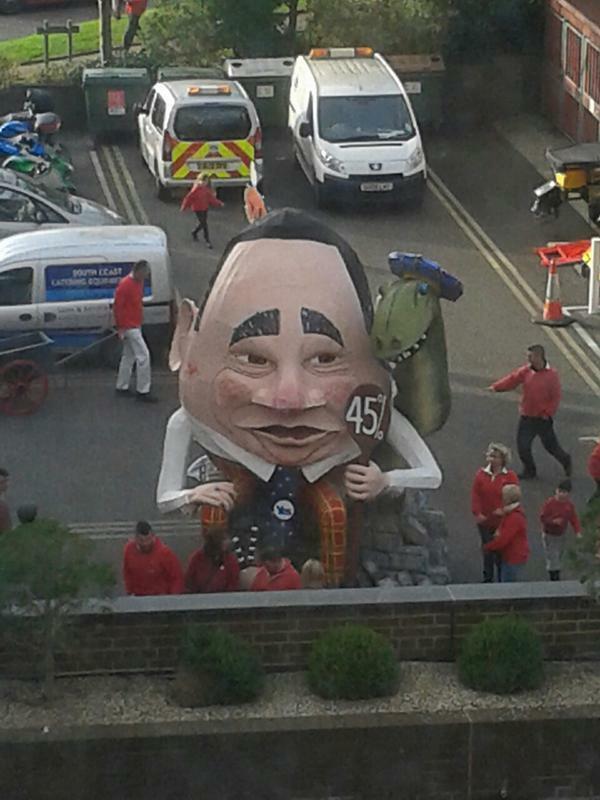 A super-size effigy of Alex Salmond will be burned tonight on an English bonfire. A “sneak preview” picture of the First Minister dummy – accompanied by a Loch Ness monster and a sign quoting 45 percent – was posted on the Twitter site of the East Sussex County Council earlier this afternoon. The council has since deleted the comment after denying it created the monstrous figure for the Lewes bonfire celebrations, and as it caused outrage on social media. But the First Minister has instead asked why “poor Nessie” has been targeted. A spokesman for Salmond added that the creators were obviously “threatened” by the 45 percent of people who voted Yes. The local authority has denied playing any part in the creation of the effigy – and blamed the local bonfire society. The Waterloo Bonfire Association have yet to comment. It is not the first time that their bonfire night has hit the headlines, with several high-profile personalities being burned down before. Pope Paul V does it on an annual basis and in 2001 the event received extra attention after burning an effigy of Osama bin Laden. Tony Blair, George Bush and Katie Price are among a number of other effigies to be burnt.